Myopia (nearsightedness) is on the rise. With our children spending more time in front of screens and less time outdoors, myopia is fast becoming an epidemic. By the year 2050, it is estimated that 50% of the world will suffer from myopia – about 5 billion people. The consequences of high myopia are more than just thick glasses. Those with myopia have a higher risk of blindness or vision impairment due to retinal detachment, myopic macular degeneration (MMD) and glaucoma. This is due to the continued elongation of the eyeball. This increase in axial length is what increases the risk of these sight threatening diseases. The consequences of doing nothing about progressing myopia are often devastating. 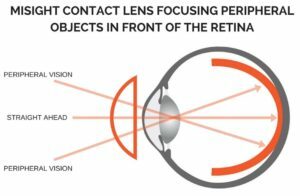 Retinal Detachment risk increases by over 20 times in myopia over –5.00D. This sight threatening condition requires invasive surgical repair within 48 hours in order to avoid permanent vision loss. Perhaps the most compelling reason to do something is the fact that a child’s lifetime risk of irreversible damage to central vision is 40 times greater in myopia over –5.00D, and over 126 times greater over –7.00D! Even the risk of glaucoma and cataracts increases more than 3 times at just –3.00D. Risk increases further with family history. Thanks to recent and ongoing research, there are now treatments to slow the progression of myopia. At Mission Eye Care, we have doctors residency trained in myopia control using specialty contact lenses and are proud to be the only clinic in Alberta with optometrists credentialed in this field. Our Myopia Control Academy Program will give you and your child the highest level of care. We work in conjunction with local ophthalmology clinics to ensure we closely monitor your child’s eyes and accurately measure the axial length of your child’s eyes using the latest technology. We offer four main options for myopia control, depending on the unique lifestyle and visual requirements of each individual patient. For all patients, at least 1-2 hours of outdoor time every day is recommended as it has been shown to be correlated with later onset and reduced progression of myopia. If there is any amount of myopia prior to age 11, myopia control strategies are recommended. There is a link at the end of this page with a myopia calculator showing how much your child’s myopia will progress without some form of control. These are soft contact lenses that work to limit the axial growth of the eye by focusing peripheral light in front of the retina. This has been shown to slow down eye elongation and therefore myopia. This method is caused peripheral defocus. Because light still focuses accurately on the central retina, clarity of vision is maintained. These contact lenses are for daily contact lens wear, and should be worn most of the day but taken off while sleeping. Misight daily disposable lenses are approved by Health Canada to control and slow myopia progression. This solution is a ideal for those with little to no astigmatism. Studies show that axial elongation (eye growth) is slowed by 46-87% with this method. The most recent study outlining their effectiveness can be found here. This treatment is considered the optical equivalent of dental “braces”. Treatment involves overnight wear of rigid gas permeable contact lenses that reshape the cornea while sleeping. Like Soft Multifocal Lenses, the idea is to create peripheral defocus. The advantage to this treatment is that upon waking in the morning, the contact lenses are removed and the cornea retains the molded shape for the rest of the day so no glasses are needed! However, unlike braces, this reshaping is not permanent. These retainer lenses must be worn every night to maintain the effect. Studies show that axial elongation is slowed an average of 43% with this method. Recent studies show the success of this method in slowing myopic progression is substantially higher, in some cases higher than 90%. For best results, it is recommended to start when the refractive error is less than 4.00D of myopia, and ideally for patients as young as 9-10 years of age. It can be started earlier depending on the maturity level of the patient. Orthokeratology has been around for decades and has traditionally been used for adults as an alternative to wearing glasses or contacts and for those who want a non-surgical alternative to laser eye surgery. Our highly trained optometrists at Mission Eye Care are skilled in all methods of myopia control, including Orthokeratology Calgary care. This is an option for those parents that are somewhat hesitant to try the options above. They work on the same principle of peripheral defocus. However, because they sit further from the eye than contact lenses, they may not be as effective. Studies show this option can reduce myopia progression by up to 30%. The next generation of these lenses is now available, read more here. Recent studies have found that 0.01 to 0.05% atropine decreases progression of myopia by 50-87% compared to a placebo group. However, we do not know exactly how this medication works to control myopia. Some side-effects of atropine include blurred near vision, less accommodation (focusing ability at near distances), and pupil dilation resulting in light sensitivity. However, these effects are minimal for 0.01% atropine. 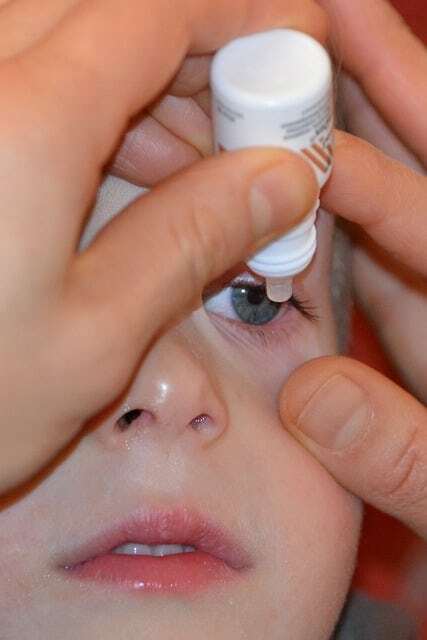 This method is recommended for children who are unable to wear contact lenses and is often used in conjunction with the Myovision eyeglass lenses described above. There are no long term studies on the potential negative effects of this treatment but eye doctors have been using this “off-label” for many years and have had great success. Your Optometrist will discuss the above methods, and make recommendations depending on the lifestyle of your child, and the goals of treatment. Through our partnership with the Gimbel Eye Centre, we have access to technologies that not only monitor your child’s myopia, but also the axial length of the eye so we can truly monitor all aspects of progression. So how often should you have your child’s eyes checked? The Alberta Association of Optometrists recommends the first eye exam for children at six months of age, then again when the child is two years old, and every year after the age of four. Eye examinations are covered under Alberta Health Care until age 19. Click on the calculator below to see how much a myopia control strategy can reduce myopic progression.